Fabulous card Pat, I love the image and brilliant layout. Great sentiment too! Fabby card Pat, love that image! Great card Pat. The image is super cute! Great card, Pat! Perfect for a teen! Great card hun, love the image & the layout is fab! 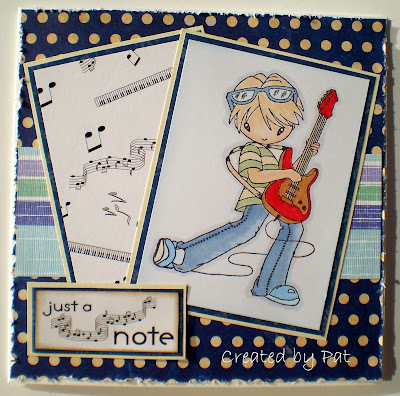 Great card, the music papers looks great with the image and the lovely sentiment. Rocking and a rolling and your coloring on this guy is so cool. Wonderful Pat and so much fun!